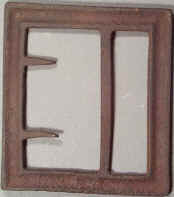 Confederate frame buckle, "gutter back" style, Confederate wartime manufacture. The "gutter" style frame buckles refers to the class of Confederate frame buckles made integral hooks, and a gutter back, this gutter was an innovative idea to strengthen the buckle. These frame buckles were made during the war in the Confederacy, they were not used by militia units prior to the war and there was no military need for them after the war. These were simple and highly effective designs that the Confederacy could produce in quantity quickly, and the troops in the field in the early campaigns were equipped with them. Supplies of the various CS plates generally followed later. The originals of these plates are fairly crude, and of course the fakes are made from these so they are crude as well, There is no sure fire way to know the authenticity of any of the plates, other than by irrefutable documentation of ownership or provenance. However an attempt is being made here to narrow the possibilities by showing multiple examples, hopefully by comparison conclusions can be drawn and and judgments made. I plan to add many more examples as I can find them to publish. Ref: Mullinax Expanded Edition, Plate 171. P0280...Confederate frame buckle, "gutter back" style, Confederate wartime manufacture. The "gutter" style frame buckles refers to the class of Confederate frame buckles made integral hooks, and a gutter back, this gutter was an innovative idea to strengthen the buckle. These frame buckles were made during the war in the Confederacy, they were not used by militia units prior to the war and there was no military need for them after the war. These were simple and highly effective designs that the Confederacy could produce in quantity quickly, and the troops in the field in the early campaigns were equipped with them. Supplies of the various CS plates generally followed later. Plate measurements not obtained. Dug buckle, no significant bends or breaks. Recovered: Clearbrook, Virginia, by Steve Baker. P0359...Confederate frame buckle, "gutter back" style, Confederate wartime manufacture. The "gutter" style frame buckles refers to the class of Confederate frame buckles made integral hooks, and a gutter back, this gutter was an innovative idea to strengthen the buckle. These frame buckles were made during the war in the Confederacy, they were not used by militia units prior to the war and there was no military need for them after the war. These were simple and highly effective designs that the Confederacy could produce in quantity quickly, and the troops in the field in the early campaigns were equipped with them. Supplies of the various CS plates generally followed later. Plate measures 67.4mm x 60.4 to 60.8mm. Dug buckle, no significant bends or breaks. Recovered: Stuart Bell farm First Battle of Winchester, Virginia, by Harry Ridgeway in the 196's. P1618...Confederate frame buckle, "gutter back" style, Confederate wartime manufacture. The "gutter" style frame buckles refers to the class of Confederate frame buckles made integral hooks, and a gutter back, this gutter was an innovative idea to strengthen the buckle. These frame buckles were made during the war in the Confederacy, they were not used by militia units prior to the war and there was no military need for them after the war. These were simple and highly effective designs that the Confederacy could produce in quantity quickly, and the troops in the field in the early campaigns were equipped with them. Supplies of the various CS plates generally followed later. late measures 66.5mm x 59.4mm to 60.0mm (not square). Dug buckle, no bends or breaks. Recovered: northern Mississippi. P1851...Confederate frame buckle, "gutter back" style, Confederate wartime manufacture. The "gutter" style frame buckles refers to the class of Confederate frame buckles made integral hooks, and a gutter back, this gutter was an innovative idea to strengthen the buckle. These frame buckles were made during the war in the Confederacy, they were not used by militia units prior to the war and there was no military need for them after the war. These were simple and highly effective designs that the Confederacy could produce in quantity quickly, and the troops in the field in the early campaigns were equipped with them. Supplies of the various CS plates generally followed later. Plate measures 70mm x 61mm, approx with bends. Dug buckle, minor bends. Recovered Rudes Hill, near US 11 south of Winchester, Va. by Steve Ritter. P1966...Confederate frame buckle, "gutter back" style, Confederate wartime manufacture. The "gutter" style frame buckles refers to the class of Confederate frame buckles made integral hooks, and a gutter back, this gutter was an innovative idea to strengthen the buckle. These frame buckles were made during the war in the Confederacy, they were not used by militia units prior to the war and there was no military need for them after the war. These were simple and highly effective designs that the Confederacy could produce in quantity quickly, and the troops in the field in the early campaigns were equipped with them. Supplies of the various CS plates generally followed later. The originals of these plates are fairly crude, and of course the fakes are made from these so they are crude as well. 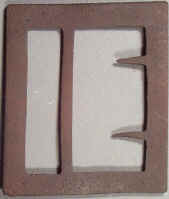 Plate measures, 61.2mm x 68.2mm. Dug plate. Recovered: Martinsburg, Virginia (now West Virginia), by Steve Baker.